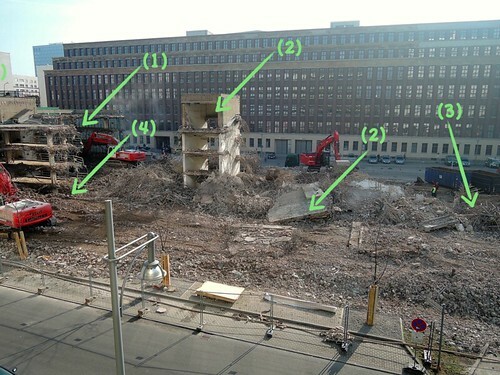 demolition_project_txt.001, a photo by Stephan’s Place on Flickr. In front of my job building I see this building site where they demolish the old parking garage. What do we see? (1) the 2 power shovel teams are pretty good and they advance quick to the end! (2) just to see that they left some difficult places untouched and some big pieces are broken out to speed up the progress but they have of course to be shred lather. (3) we see that they need to separate steel parts which is mostly left for lather work too. Perhalps the main priority was a quick advance. (4) here we see the the basement is filled up with the granulate, however what we don’t see is the concrete fundament that ha to be shed too. this project will take more time that it looks right now. You are currently browsing the iqupi's world blog archives for the day Friday, March 7th, 2014.